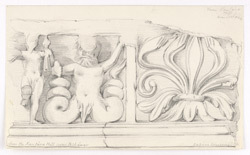 Pencil study by Frederick Charles Maisey (1825-1892) of a frieze from Kantara Hill near Peshawar in the North-West Frontier Province of Pakistan, dated between 1845 and 1852. The image is inscribed: 'from the Kantara Hill near Peshawar. Lahore Museum'. From the first and second centuries AD onwards, Peshawar in northern Pakistan was famous for it's sculptural traditions. Known as Gandhara, it was ruled by a dynasty of Chinese origin called the Kushans. They were Buddhists and under their rule, the religion and the arts associated with it were allowed to flourish. The drawing depicts an example of the Graeco-Roman influenced Gandharan style of sculpture, the first examples of which date from the reign of the Kushan king Kanishka who reigned from 78 AD onwards.